With an Alpine shape whose narrow silhouette is suited to mountain travel on steep and demanding terrain, the TRILOGY 35 backpack is designed for mountaineering devotees, and suited to long day trips or multi-day excursions. The HARNESS BACK is lightly padded and covered with 3D mesh to promote moisture removal; and is supported by a lightweight internal fiberglass frame. The load-adjusting suspension system comprises ergonomic foam-padded shoulder straps and a harness-style flexible hip belt. The minimalist lidless top opening has a protective, reinforced ROLLING CLOSURE like a dry bag's, offering excellent resistance to bad weather, with compression straps handy for carrying climbing ropes. A zipped front compartment replaces the regular top lid space. Another compression strap (top of back) lets you reduce pack volume once you have used up load and are heading back down. The ice axe holding system makes the TRILOGY 35 very adaptable: the FPP Ergo is built into the pack front, with blade protection sleeves. The QUICK AXE system has fast-access straps to fasten the axe heads: it adapts to all axe shapes, ergonomic and straight. Two haul loops allow secure transportation. The rugged Kodura nylon on the pack base offers enhanced tear-resisting protection, with a very dense weave combining toughness and extreme durability. The main compartment is crafted in robust CORDURA, in a ripstop weave with super-tough nylon threads that add strength but not weight. 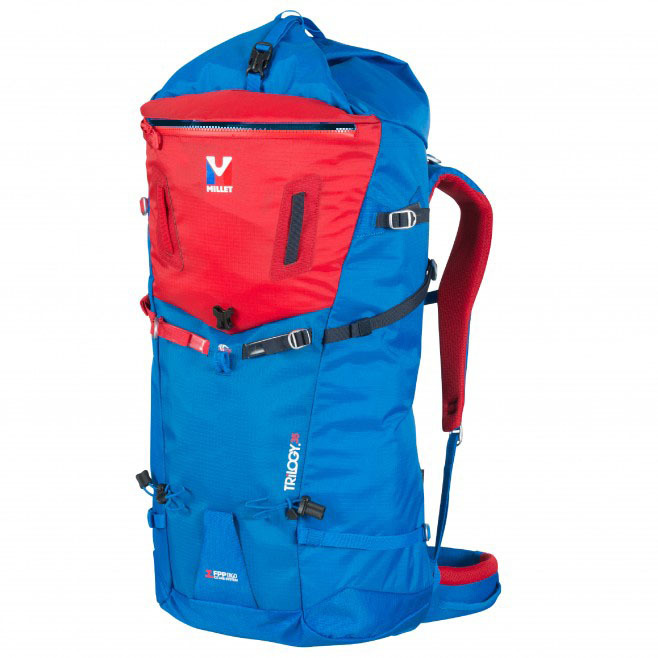 The smooth surface enhances the pack's sleek design, and a hydrophobic finish adds extra protection. The TRILOGY 35 takes its name from the challenge undertaken by MILLET team mountaineers �ric Escoffier and Christophe Profit: a solo winter enchainment of three north faces (Eiger, Matterhorn, Jorasses). In the field of mountaineering equipment, Trilogy is the quintessence of alpine performance: the best technical solution for committing in the vertical realm. In summer in Chamonix, on dizzying granite faces, climbers rise up with beautifully fluid efficiency, elevating Trilogy products to the peak of performance.